One of the blessings of returning to my homeland is spending time with long-time friends, and visiting with friends who came into my life more recently. They are a gift from God. They fill my life with laughter and encouragement. They are loyal to the friendship and treat me with kindness. A friend constantly remembers you in their prayers. During your lifetime you are extremely blessed when you have loyal friends. For example, when you have a long-time friend there is a history between the two of you. The roots of your relationship grow deeply and there is a foundation built so that even though you may not see each other for a space of time, you are able to pick right up and start again from where you left off. The word friend, or friendship, has been homogenized in today's society. There is not an appreciation that there is a distinct difference between an acquaintance and a loyal friend. Webster's dictionary describes acquaintance as: “a person whom one knows.”, and a friend as: “a person attached to another by feelings of affection or personal regard.” You have many acquaintances in your lifetime, however there are fewer people who you can count as a loyal friend. A special friendship was recorded in the Bible in I Samuel between David and Jonathan. Jonathan trusted God, and was the most faithful friend that David ever had. A footnote in one of my Bibles states: “they encouraged each other's faith in God, and trusted each other with their deepest thoughts and closest confidences.”(NLT) Do you have friends like Jonathan? In a book written by Millie Stamm in 1967 she related a story about an old Lancashire woman who listened as several members of her church talked about their minister's success. The members credited his success to his gifts, his style, and his manner. The old woman didn't agree with them, and she said, “I will tell you what the secret is. He is very thick with the Almighty.” The minister had an ongoing friendship with Jesus Christ. That was his secret of success. Millie Stamm also reminds us that God provides us with a friend who loves us at all times. That friend is Jesus Christ. He is always with us twenty-four hours a day; seven days a week. We are free to express our deep sorrows with Him, and also share our joys. He confirmed His love for us when He died on the cross for us. He is our Friend of all friends. We can call upon Him in the middle of the night! 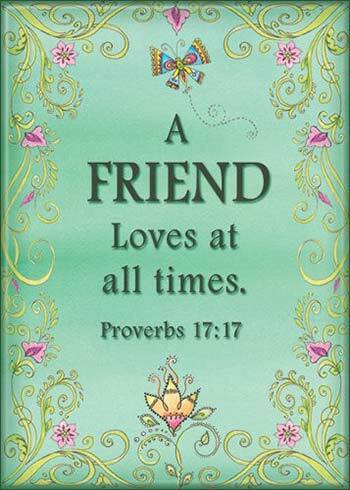 Lord God, thank You for the friends that You have placed in our lives. Help us to always remember that Jesus Christ is our greatest Friend. Amen.